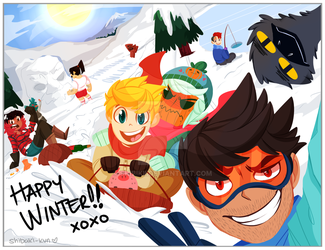 Thank you so much guys for the fanart! 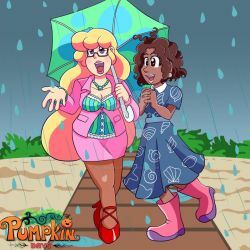 Pumpkin Days is a farming dating rpg. Have fun with activities like farming, fishing, cooking, raising animals, mining, crafting, house customization, dating townsfolk and more all in a large 3D environment with a cute anime-inspired aesthetic. Hey guys guess what we’re having! Another fanart contest! We ran one when we had our successful Kickstarter in 2014, we had one for when got our game greenlit on Steam in 2017 and now we’re holding a big one forthe game's steam release this year! THEME: Just draw the Npcs from our game. There are quite a bit of rules for this contest so make sure you read them here or on the website or you will not be able to qualify. Must have our game logo or the game's name somewhere on the picture. You can find the logo in the press kit. Cannot contain characters from other games or shows. "This is my entry for the Pumpkin Days fanart contest. 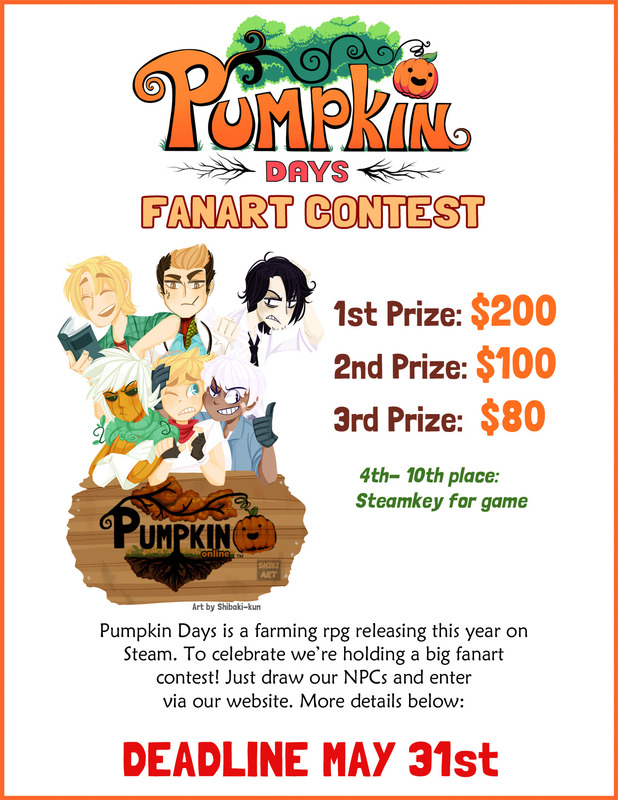 Pumpkin Days is a new farming rpg indie game coming out on Steam soon, check them out here [link])"
We do not own your artwork and we cannot use without your permission. Collaborations are allowed but only 1 person is responsible for collecting and fairly distributing the payment. We will not split prizes among multiple artists. Digital and Traditional Entries are allowed. Our game is still in development so you don’t need to follow the designs of our buildings and world precisely as they may change. As long as it’s close enough that's fine. Not required but we will appreciate it if you tagged your picture #PumpkinDays so it's searchable. You can mix NPCs from different towns. Shipping between any character is allowed. To increase your chances or winning we have more guidelines about how we judge on the website. Any questions you can ask in the journal or send us a note. 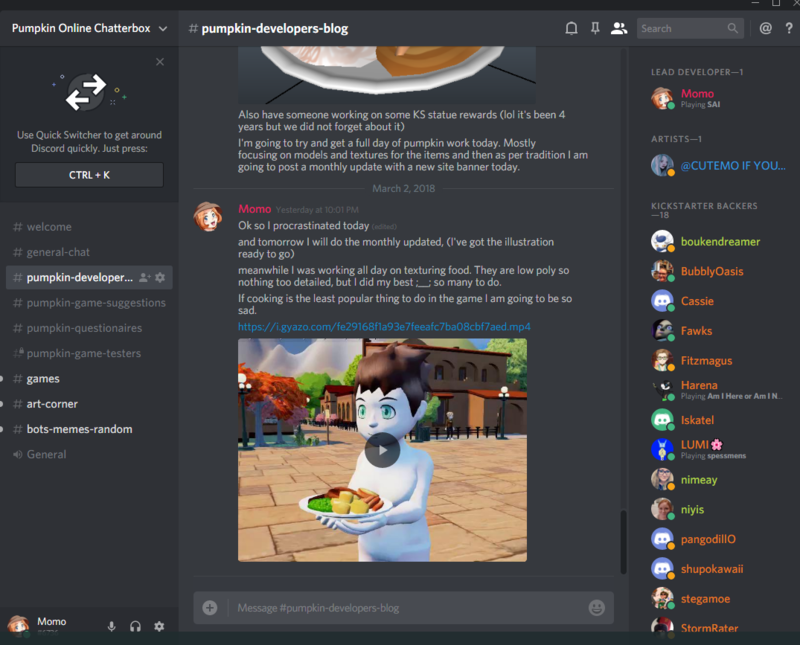 Pumpkin Days is a multiplayer, farming, dating rpg currently in development by a small indie studio. We were Kickstarted in 2014 and now we are getting ready to release on Steam in 2019! For more information be sure to visit our website f. Some fun features of our game we plan to have are. - Open character customization which allows for non-binary characters! - Clothes and accessories not limited by gender! - Have a farm and customize both your house and yard! - Do activities like, farming, fishing, mining, sewing, ranching and more! - Marry anyone you want in town regardless of gender! - Do all these either solo or with friends online! - A diverse cast of NPCs to interact with and marry! Just to name a few, visit our website for more information! When the game reaches a point where a playable demo is possible, will it be open to the public (like Yandere Simulator), or will it be purchasable as an early access game? Hi sorry for the super late response. Yeah we are planning on making it available for the public. We're not sure when because we have to do extensive testing to make sure it is not only bug free but fun. We should be releasing sometime next year. Happy Belated Birthday! So nervous and excited about the contest!!! I hope your days are going great. Have the best day and luck!